We finds a new trailer for the Hobbitses movie! Maybe it wants to see it. We doesn't want Baggins in our cinema. We has to see him enough in the movie, don't we, precious? Baggins can stay away. Andy Serkis! 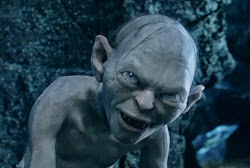 He brings Smeagol to life! He plays us very well, helps people to know us, yes? Helps them care about us? Yes precious, Andy Serkis we likes very much. I agree, the trailer is a good one. And, yes, Andy Serkis is definitely a very good actor . Yes, yes he is! He is, precious. Very good actor, very good. Nice to Smeagol.